When you think of your energy company, the first thing that comes to mind is probably the crews you see in the bucket trucks fixing or maintaining the wires. And that’s good. Because those people are the heart and soul of what we do. But behind the scenes, much more takes place to ensure that when you flip the switch, the lights come on. This is the third in our series, Energy Enlightenment, which aims to simplify the very complicated energy business. Everything starts with the system, of course. My last two posts focused on electricity generation, and the transmission and distribution system, how it’s built and maintained, and a little about how it works. Inside of the company, it starts with customers. When a new home or facility is built, the energy company gets a request for new service. Planners work with the builder or developer to determine the type of service needed (residential or commercial), the site design, and the nearby distribution wires to tap. Planners lay out the design for the new electric service and field crews make it happen. Depending on the topography, the field crews use backhoes, rock saws, and a variety of other heavy equipment to install services underground. Overhead services use bucket trucks to tap into electricity and transformers on the poles. While a site is under construction, the builder or developer pays for the electrical service referred to as TOPS or “temporary on permanent service.” Behind the scenes, accounts are set up, meters ordered, service addresses entered into a database, and schedules set to transfer the meter into permanent service for the ultimate owner or tenant. Once a new service is connected – whether new construction or just a new occupant or tenant, an account is set up. This requires a team of people who operate the computer program, link to the internal accounting and establish the billing process. Bills are typically generated from reading meters. CPS Energy has three different types of meters in our system that generate more than 728,000 bills each month. More than 308,000 old school dial meters require a meter reader to visit backyards, risk dog bites, endure weather extremes to physically read the meter. Another 366,000 meters are OMR (offsite meter reading) or radio read meters. These meters send a radio signal to a data collection device close by, such as in a car, that allows the meter reader to quickly and safely collect information from the meter. Thus far, just 38,000 meters are “smart meters.” For the record, this is what I have. I didn’t ask for it; I just happened to be in one of the region’s where they were installed first. That said – it’s totally cool. Not only is the data transmitted automatically to CPS Energy, but it allows me real-time access to my energy use. Of course smart meters not just for customers’ benefit, but that’s another blog topic (coming soon). Another group of people take responsibility for delivering your bill, either electronically or on paper. The electronic version requires IT (information technology) people to get the data onto your computer screen correctly and attractively (yes, it matters). Print shop people have to take a computer file and transform it into printed bills and stuff those bills into envelopes. When you pay your bill, the billing team notes that your bill is paid, and the money is dumped into a general fund for the accounting people to sort out. The accountants allocate the money. Up to 14% of gross revenues go to the City of San Antonio’s general fund, and the rest toward maintaining and repairing the power plants and distribution system, replacing old components, building new generation plants or expanding the distribution system, maintaining our facilities and equipment, paying employees and paying the company’s bills. Lots of other people –and functions – keep electricity flowing consistently and reliably to your home or business. CPS Energy has more than 700 light duty cars and trucks, 805 medium duty trucks, 65 heavy-duty trucks, and 434 trailers, along with 476 pieces of other equipment consisting of everything from golf carts and four-wheelers used at the power plants, forklifts, air compressors, welders, tractors, backhoes, skid loaders, excavators, dozers, and scrapers. 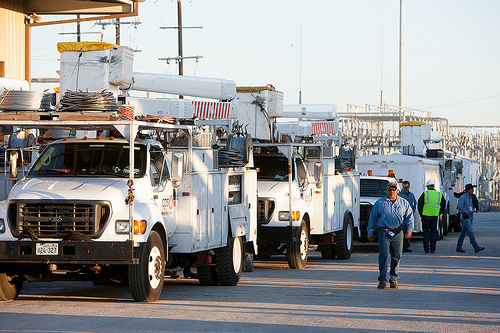 We also maintain and repair over 100 generators and approximately 250 aerial units mounted on our medium duty trucks. A team of 89 mechanics and support service people keep all the vehicles and equipment running, as well tracking all maintenance records, mileage, and work assignments. Each vehicle is on a maintenance schedule to ensure maximum life and dependability. The fleet operations team also provides fuel, washing, tire repair, and other preventive maintenance. Trucks are a critical part of the business. Each truck costs more than $100,000. CPS Energy has 870 medium and heavy-duty trucks. The fleet operations and repair budget is approximately $14 million per year, and about $8 million a year is required to replace vehicles and equipment. CPS Energy fleet travels more than 13 million miles per year and uses more than 2 million gallons of fuel. Pretty amazing. Purchasing and contract specialists ensure the company gets the best prices, warranties, and contract terms. From passenger vehicles and heavy machinery to assorted tools and office supplies, these specialists make sure the company gets the most for its dollar while also serving as a watchdog for ethical trade practices. Attorneys make sure that our contracts are in order and protect the company from unnecessary risk. Government liaisons work with local, state and federal elected officials to understand what different customers around the city expect and consider important, and to keep them informed about how CPS Energy works. And the power plants employees. Can’t forget those very important folks! CPS Energy has seven natural gas and coal power plants with multiple generating units in each that are staffed by more than 500 people. Plus we have people who manage and coordinate the energy generation of our six wind farms, three solar farms, and nuclear plant. This brief overview doesn’t even begin to cover everyone and everything that works behind the scenes to get electricity to you — but I hope you’re getting the idea. There’s much much more to flipping the switch than you ever imagined.